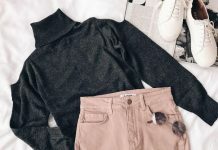 “Is the casual teen outfit perfect for adults?” This question often becomes a burden for many women as they want to try to look younger and feel the youth in their adulthood. Well, the only answer is to listen to your desire. All of the outfit styles are free to wear whether you are still young or even you already hit your 30s. You deserve it. 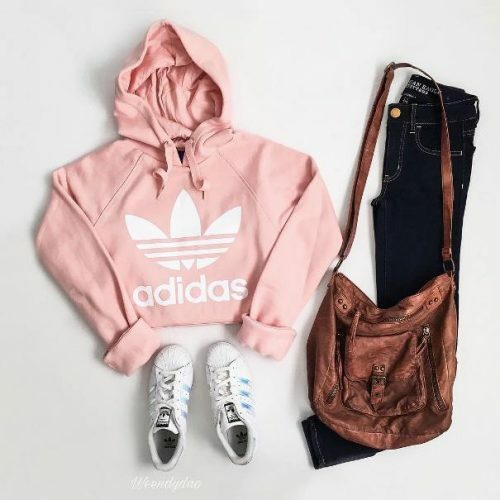 Back again to the casual teen outfit, we try to brighten up your day with the Adidas items that simply will boost your mood and make your appearance more energetic and young. Today we have the cropped Adidas hoddie in pink color with printed Adidas iconic logo. 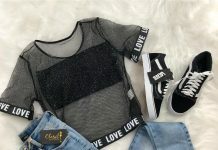 You can bring the street style on your active day with the long jeans and the white sneakers with you as these items are so neutral and perfect for some casual occasion. You can also complete your look with the great leather shoulder strap bag so you can store your things in ease. What do you think? The best part of wearing a crop top is when you pick the high waist pants so this will emphasize your hips shape and make you look curvier. Instead of wearing a regular hoodie, the cropped top is the best item to look slimmer.